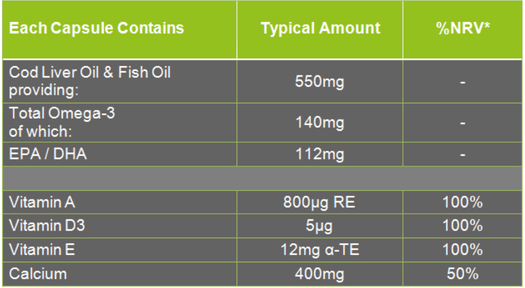 Our premium quality, Cod Liver Oil & Calcium capsules are rich in Omega-3 fatty acids. with 112mg of EPA/ DHA per capsule. These important fatty acids have cardioprotective benefits and contribute to brain function and joint mobility. The added Calcium along with Vitamins A and D which are found naturally within cod liver oil, contribute to normal; bones, muscles and teeth. Calcium also contributes to normal neurotransmission and the function of digestive enzymes. These Cod Liver Oil capsules also contain Calcium which along with the Vitamin D found naturally within cod Liver Oil helps maintain normal healthy bones. Calcium Carbonate, Cod (Fish) Liver Oil (14.6%), Fish Oil (14.4%), Beef Gelatin, Humectant (Glycerol), Thickener (Beeswax), DL-Alpha-Tocopheryl Acetate, Colour (Plain Caramel), Sunflower Oil, Emulsifier (Rapeseed Lecithins), Antioxidants (Mixed Tocopherols), Retinyl Palmitate, Corn Oil, DL-Alpha-Tocopherol, Cholecalciferol.